Bacolod City - Good news for the seafarers in Negros Occidental, the new Maritime Industry Authority (MARINA) 6's (Western Visayas) extension now ready to serve Negrense seafarers. This would benefit thousands of seafarers in the region as they will no longer need to go to manila to process their papers and take the Deck and Engine Officer's Licensure Examination. The four-story building is located in the Panaad Park in Brgy. Mansilingan, was inaugurated on Friday, September 28, 2018, led by Gov. 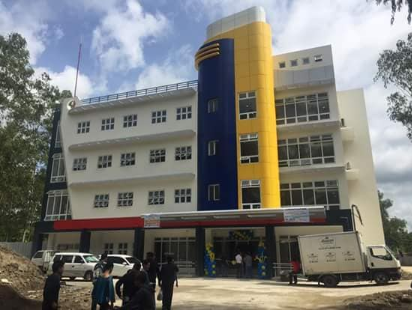 Alfredo Marañon Jr.
MARINA-6 Director Rizal Victoria said the extension office in Bacolod will not only be used to process important papers but will be utilized as a training and a research center as well. Negros Occidental's provincial government has been providing scholarships for students who want to join the maritime industry. The province was in partnered with VMA Global College and training Centers, Inc. for a "study now, pay later" scheme for licensed mechanical engineers who opted to shift to maritime engineering and study in the school for six months. MARINA, an agency under the Department of transportation, was tasked for the implementation of the International Convention on Standards of training, Certification, and Watchkeeping for Saefarers.